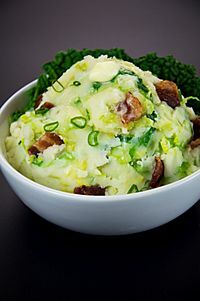 Colcannon (Irish: cál ceannann, meaning white-headed cabbage) is a traditional Irish dish mainly consisting of mashed potatoes with kale or cabbage. It is traditionally made from mashed potatoes and kale (or cabbage), with milk (or cream), butter, salt and pepper added. It can contain other ingredients such as scallions, leeks, onions and chives. There are many regional variations of this dish. It is often eaten with boiled ham or Irish bacon. At one time it was a cheap, year-round staple food, though nowadays it is usually eaten in autumn/winter, when kale comes into season. An old Irish Halloween tradition is to serve colcannon with a ring and a thimble hidden in the fluffy green-flecked dish. Prizes of small coins such as threepenny or sixpenny bits were also concealed in it. Colcannon Facts for Kids. Kiddle Encyclopedia.